I make my own chocolate as you know, so the only thing that was missing was a way to get them into itty-bitty bits. 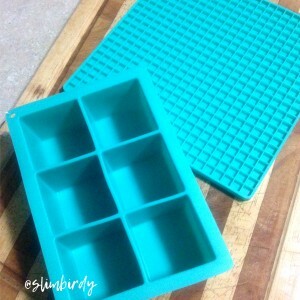 Then I was cruising the novelty colourful kitchen gadgets at Kmart, as I am a sucker for a silicon mould or 10, and found this pot holder (the one at the top)…. Only $2 and I think you can guess that it won’t be holding any pots! Look at the cute little squares. So now when I make a batch of my Chocolate Tweets for any other purpose, I fill up one of these too and whack it in the fridge to set. 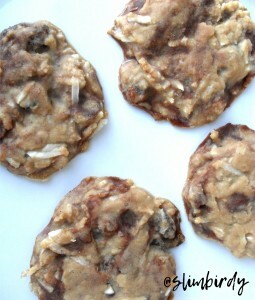 Once set, I pull them out and store in a container until the recipe calls for Choc Chips. Yum! The choc chips instead of dried blueberries made them taste a little like heaven! The only thing is – don’t get one unless you have a dishwasher – otherwise cleaning every little tiny square would be a nightmare. 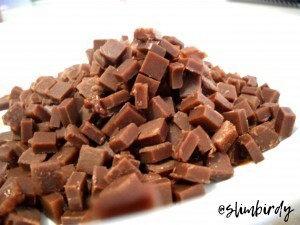 And here is a link to my Chocolate recipe just in case you haven’t made it before. Now what should I add them to next? Brownies? I think so!